Khalifa ibn Khayyat was born in the southern Iraqi city of Basra in the 770s AD and in his lifetime Iraq grew into a thriving centre of culture and trade and one of the most populous and prosperous regions of the world. He was one of a generation of scholars who gave concrete form to Islamic religion and culture and bequeathed to us the first books that can be said to be distinctively Islamic. Khalifa’s History is the earliest extant work of Muslim historiography and this alone makes it deserving of greater recognition. It carefully records the key events in the life of the Muslim community from the prophet Muhammad to Khalifa’s own day. The section on the Umayyad dynasty (660-750), which occupies about half of the work, is noteworthy because it gives a more positive assessment of the Umayyad caliphs than later narratives. Over time they were increasingly censured for having corrupted the purity of early Islamic society, and yet it was they who had overseen the conquest of cities as far afield as Seville and Samarkand and established Muslim rule over all the lands inbetween. They built the magnificent mosques of Medina and Damascus that still stand today and the palaces that litter the desert margins of modern Jordan and Syria. Khalifa’s History helps us to better evaluate the achievements of this dynasty and also to analyze the beginnings of the discipline of Arabic historical writing in the framework of Islamic civilization. 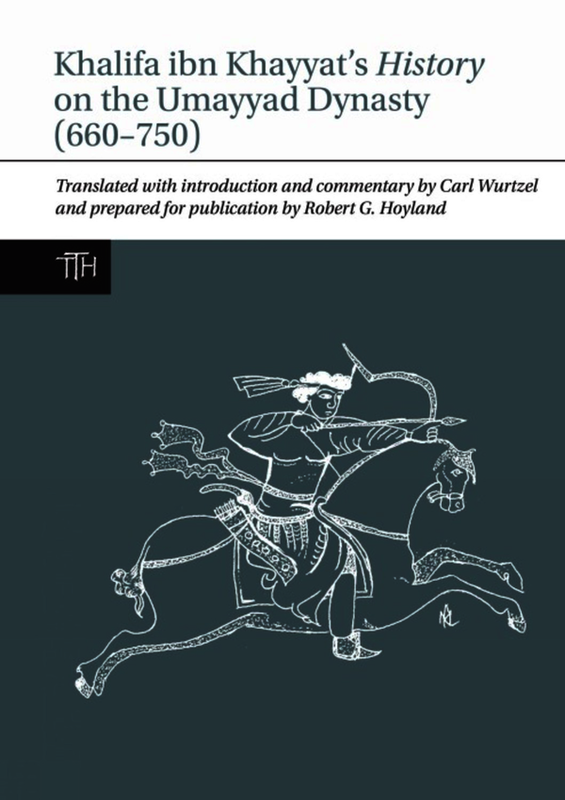 This study and translation was originally submitted by Carl Wurtzel as a doctoral thesis at Yale University in 1977 under the supervision of Franz Rosenthal, one of the greatest Orientalists of modern times. It has now been prepared for publication, with a Foreword and updated bibliography, by Robert Hoyland, professor of Islamic History at Oxford University. Khalifa ibn Khayyat was born in the southern Iraqi city of Basra in the 770s AD and in his lifetime Iraq grew into a thriving centre of culture and trade and one of the most populous and prosperous regions of the world. He was one of a generation of scholars who gave concrete form to Islamic religion and culture and bequeathed to us the first books that can be said to be distinctively Islamic. Khalifa’s History is the earliest extant work of Muslim historiography and this alone makes it deserving of greater recognition. It carefully records the key events in the life of the Muslim community from the prophet Muhammad to Khalifa’s own day. The section on the Umayyad dynasty (660-750), which occupies about half of the work, is noteworthy because it gives a more positive assessment of the Umayyad caliphs than later narratives. Over time they were increasingly censured for having corrupted the purity of early Islamic society, and yet it was they who had overseen the conquest of cities as far afield as Seville and Samarkand and established Muslim rule over all the lands inbetween. They built the magnificent mosques of Medina and Damascus that still stand today and the palaces that litter the desert margins of modern Jordan and Syria. Khalifa’s History helps us to better evaluate the achievements of this dynasty and also to analyze the beginnings of the discipline of Arabic historical writing in the framework of Islamic civilization. Khalifa ibn Khayyat is the author of the earliest extant Arabic chronicle. The work principally deals with fighting between Arab groups, external conquests, and administrative matters. After the death of each caliph it lists the persons who held office (as governors, judges and secretaries) during his reign; it also notes who led the pilgrimage in each year, the death of prominent persons (included those who died in major battles), and natural phenomena. Events are for the most part narrated quite briefly and the work was presumably intended as a useful guide to Islamic history and a complement to his biographical dictionary of scholars, which also survives. Carl Wurtzel translated the portion of Ibn Khayyat’s chronicle that relates to the Umayyad period (AD 660-750) for his PhD thesis (Yale, 1977). The translation is of a high standard and is well annotated. The introduction is useful for providing an overview of the life and oeuvre of Ibn Khayyat and a survey of his sources, as well as a consideration of the apparently pro-Umayyad bias of the author. Ibn Khayyat’s chronicle is relatively early in date. It also has quite wide scope, especially as regards its narration of the Arab conquests, ranging from Spain across the Mediterranean and all the way over to Central Asia. It is by far our earliest Muslim source for these campaigns. Dr Carl Wurtzel is a professional translator; certified by the American Translators Association as a translator from Arabic to English. Carl is also an instructor in the New York University (NYU) School of Continuing and Professional Studies translation program. Robert G. Hoyland is Professor of Late Antique and Early Islamic Middle East History at the Institute for Study of the Ancient World of New York University. Previous publications include 'Theophilus of Edessa’s Chronicle and the Circulation of Historical Knowledge in Late Antiquity and Early Islam' (LUP, 2011).